Seche Vite, we have had some great times together. You have allowed me to go to bed right away without pillow marks all over my nails, you have given me endless shine and you have taken the waiting part of the manicure away. But we need to talk, we haven't always got on famously: you have peeled, shrinked my polish a little, gone gloopy and unmanageable, and there is that small matter of all the warnings being thrown around about some of your ingredients. So this isn't easy for me to do, but I think we should have an open relationship- I am seeing other top coats. There are so many other quick dry top coats out there now so deciding was hard, but I wanted one that was reasonably priced, gave a good shine and dried very very quickly. 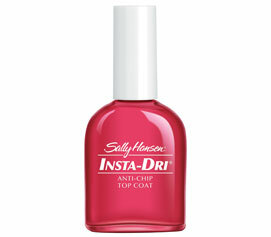 Now it is early days yet but so far things are really working out with me and my new Beau, Sally Hansen's Insta Dri. Priced at £6.08 in Boots and after hearing some great reviews of it, I had to give it a whirl. Long-lasting shine, chip resistance and a great manicure that dries fast and lasts.The exclusive acrylic polymer complex dries any nail colour in 30 seconds. Nail colour stays true thanks to UV filters, which prevent fading, yellowing & discoloration caused by sunlight while offering superior shine. For £6 this top coat really packs a punch, it is not quite the lightening dry of Seche Vite, it does take 30 seconds but that is a small price to pay if it means I have a bottle I can use right to the finish without it turning into a gloopy mess. I like the runny wet consistency of it, I find it glides over the polish really easily and doesn't drag or ruin the colour. I have only used it a couple of times, so I will keep you updated if it falters but so far it has kept my nails chip free, and without the peeling I have experienced recently. Anyone got other quick dry top coats they can recommend? I'm currently using this top coat and I think it's OK, it does dry pretty quickly but it sure doesn't protect my nail polish from chipping up to 10 days. I might just buy a thinner- decisions! I hope you get on with it better than I did.